The Trump-Russia scandal and the Moscow Project. The Moscow Project tries to solve the mystery of Trump’s Russian entanglements. 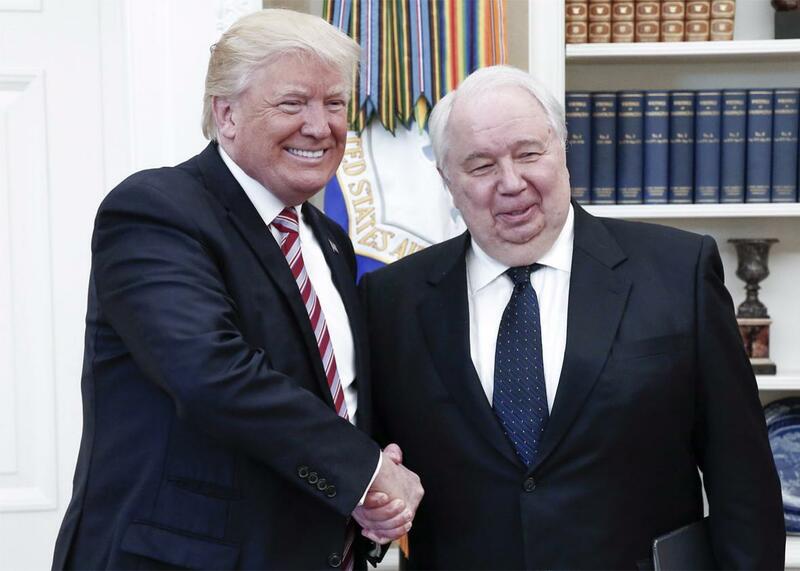 President Donald Trump shakes hands with Russian Ambassador to the United States Sergey Kislyak in the Oval Office at the White House on May 10. On Aug. 27, Harry Reid, then the Senate Democratic leader, sent a letter to James Comey, then the FBI Director, asking for an investigation of ties between Donald Trump and Russia. “The evidence of a direct connection between the Russian government and Donald Trump’s presidential campaign continues to mount,” Reid wrote. Over the summer, Reid’s office had obtained a copy of the now-infamous Steele dossier—a report on Trump’s Russia connections compiled by a former British spy—and was desperately trying to make both journalists and government officials seriously consider the idea that Trump was compromised. There was widespread suspicion in D.C. of Trump’s Russia connections; thanks to a secret recording obtained by the Washington Post, we now know that House Majority Leader Kevin McCarthy told his colleagues last June that he thought Trump was being paid by Putin. But somehow, amid all the chaos and weirdness of the campaign season, the Russia storyline never quite broke through. On Oct. 30, two months after his first letter, Reid wrote to Comey again. “In my communications with you and other top officials in the national security community, it has become clear that you possess explosive information about close ties and coordination between Donald Trump, his top advisors, and the Russian government,” he wrote, adding, “The public has a right to know this information.” Reid’s staff kept trying to get the story out, but they couldn’t get much traction. “You could build a very compelling case, but without the gravity of an FBI investigation, it didn’t stick,” Adam Jentleson, Reid’s former deputy chief of staff, told me. Now, of course, we know that when Reid wrote his first letter, an FBI investigation into Trump and Russia had already begun. The Jan. 6 intelligence community report on Russian hacking in the election confirmed that Russia actively worked to help Trump. This was a theory that Jentleson had found unbelievable when he first encountered it almost a year ago; even in October, it was the “most extreme” of all the scenarios he thought might be possible. Reality has consistently outstripped the alarms Jentleson and his colleagues tried to sound. Yet the Trump-Russia picture still hasn’t quite come into focus. We have congressional investigations and a special counsel, but our collective reaction to this scandal feels somehow incommensurate with the possibility that the president of the United States has colluded with a hostile foreign power against our democracy. Jentleson is trying to change that. With Reid no longer in the Senate, Jentleson now works full time to understand and publicize the Trump-Russia story. In February, he helped found the Moscow Project at the CAP Action Fund, an arm of the Center for American Progress. With a staff of five that will soon double to 10, the project is part clearinghouse, part think tank, and part private investigation agency; it recently hired a Russian-speaking forensic accountant from a high-profile firm. Its website keeps track of the ever-expanding story of the scandal and its key players, while its staffers brief members of Congress and compile reports on matters related to the Trump-Russia nexus. They try to coordinate experts across fields—including money laundering and counterintelligence—to get the clearest possible picture of what is happening with the scandal and the investigation. “There are so many different angles that there’s not one person who knows everything,” said Jentleson’s Moscow Project colleague Max Bergmann, a former member of the State Department’s policy planning staff. “You don’t have to believe that Trump is a full-on agent of Russian intelligence to believe that what’s already been established about his connections is deeply troubling,” Jentleson said. “Especially when you combine them with the policy positions that he’s taking towards Russia.” Yet because there’s still so much that we don’t know about Trump and Russia, and so much deliberate misinformation floating around, it’s easy for anyone tracking all the connections to fall into paranoid rabbit holes. For Jentleson and his colleagues, part of the work of the Moscow Project is to limn a possible conspiracy without falling into conspiracy theorizing. “Everything that comes out of our project has been vetted through CAP’s team of policy experts, and frankly our legal team,” he said. Nevertheless, maintaining one’s equilibrium when examining the Trump-Russia story isn’t easy. As Bergmann recently told the Daily Beast, “This is the first time I’ve seen the national security community with their hair on fire way more than the political pundit class.” I found this quote striking because, as a minor member of the political pundit class, I’m often not sure how I should be reacting to the ongoing Trump-Russia revelations. The possible scope of it is mind-bending: an election of questionable legitimacy, corruption and subversion at the highest levels of government, maybe even a president who is an unwitting Russian agent. How can such a thing be true? The hypothesis is so outlandish as to seem self-discrediting. And yet the idea that the Trump-Russia story is a conspiracy theory is also a conspiracy theory. It requires one to believe that every American intelligence agency is part of a plot to defame Trump and that the Trump campaign’s staggering multitude of Russia connections has an innocent explanation that no one has yet bothered to put forward. This scandal is unique in that none of the president’s defenders have even tried to describe an alternative theory of the case that would account for all the weird facts that have come out. There’s no version of the Trump-Russia story that is not completely disorientating, that doesn’t challenge our fundamental sense of plausibility. Meanwhile America staggers forward in a state of half-normality. It’s very hard to get a handle on. During Watergate, before voters could come to terms with emerging evidence of Richard Nixon’s crimes, they first had to overcome their own incredulity. In The Battle for Public Opinion: The President, the Press, and the Polls During Watergate, sociologists Gladys Engel Lang and Kurt Lang traced the evolution of public perceptions over the course of the scandal. As they pointed out, many of the basic facts of Watergate were known before Nixon’s re-election; his opponent, George McGovern, tried and failed to make Watergate an issue during the campaign. Yet the claims proved to be too far removed from how voters understood their country for them to internalize them. “The charge that a President could have involved his own staff in a ‘third-rate burglary’ or in the ‘laundering of campaign funds’ or could have promised the people ‘the most thorough investigation ever’ that would later prove pure fiction seemed outlandish to most people,” Lang and Lang wrote.